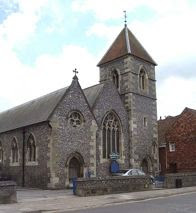 A commemorative plaque celebrating the nineteenth-century architect AWN Pugin was unveiled last week at St Osmund's Church, Exeter Street, Salisbury (shown here) -- a church Pugin helped design in 1847. Pugin (1812-1852) was one of the most accomplished architects of the Victorian era and a leading exponent of the Gothic Revival style. As well as contributing to the design of the new Houses of Parliament in 1834, he played an influential role in the design of numerous well-known buildings around the country, and, after moving to Salisbury with his second wife, he became particularly active in this area. Pugin (shown here) designed St Marie's Grange in Alderbury as a private property, restored the building that is now the cinema in New Canal, and later designed St Osmund's. It was at that church that members of the Salisbury Civic Society gathered last week to unveil the commemorative plaque and pay tribute to Pugin's architectural influence. The church's foundation stone was laid on 8 April 1847 and the building was consecrated on 6 September 1848. At the time the Salisbury Journal described the whole composition as "small and unpretending," although it "bespeaks itself as the production of one thoroughly conversant with the principles of Christian art; and we may add, that amongst the many beautiful edifices with which the skill and ability of Pugin has adorned our country, none more sustains his deserved celebrity than does the church of St Osmund, at Salisbury." 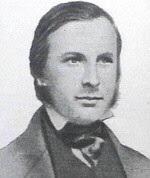 John Elliott, a Civic Society member and former lecturer in art and architectural history at the University of London, noted Pugin's place in history. "There is no doubt that Pugin was the single most important English architect of the early-Victorian era and it is only right for him to be commemorated in this way. He had a short life and died aged 41, but he had an enormous impact -- one much greater than most of us achieve in double the years. And it is particularly fitting that the plaque is here in Salisbury because the city had a huge impact on his life - it was here that he converted to Catholicism and wrote some of his most influential works - and really helped to make him into the Pugin we remember today." 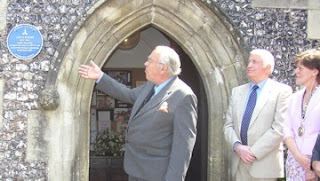 The plaque was formally unveiled by Civic Society president Lord Congleton. For anyone looking to learn more about Pugin, I can highly recommend Rosemary Hill's new biography - 'God's Architect'. Fraser (Christchurch, Dorset).